I think back to when I first launched my business and I had multiple bids to businesses for projects, and I had a bunch of side projects. Wow, I’m juggling so much that I’m not really going the distance in any one area. And that really brought me back to what I’ve been doing throughout my career. I noticed once I launched my business, it was as if I forgot what I should be doing to really streamline my systems, put myself out there and grow my business. From that point forward, I took some key steps that led me to go the distance as a business coach and create a multi-six-figure coaching business. I’m going to share those steps with you today. First, it’s all about creating one of your signature offerings and make sure you’re not juggling many offerings. Focus on one to two major offerings only, not more than that. So now that you’ve created this beautiful offering you get to articulate it in a way that lands with the people you want to attract. In order to deeply connect with the audience, you get to deeply connect with yourself first and get aligned with your offering. Then you get to market it! If you have fears or hesitations come up, it is your duty to share what you have to offer anyway. Someone out there is looking for exactly the work you do, I know that for a fact. Check out my Facebook live strategy for one of my favorite ways to connect with ideal clients. One of my favorite tools to use during my Make a Difference conversations is the PSR framework. Problem: Define the problem you or a client had. What was getting in the way? Solution: What was the way the solution to the problem? How was it fixed? Result: What as the result once the solution was implemented? Create, connect, offer are the 3 simple steps I’ve followed to create a multiple 6-figure business, and I’m so glad I’ve shared it with you today! I created a workbook to get you clear on your unique marketing message. 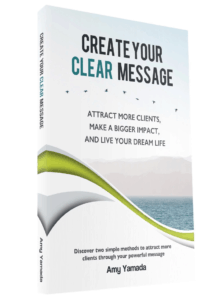 No matter what level you’re at in business, this book will make a huge difference for you and support you in getting unstuck when it comes to your message.